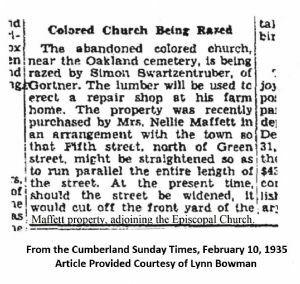 The abandoned colored church, near the Oakland cemetery, is being razed by Simon Swartzentruber, of Gortner. The lumber will be used to erect a repair shop at his farm home. The property was recently purchased by Mrs. Nellie Maffett in an arrangement with the town so that Fifth street, north of Green street, might be straightened so as to run parallel the entire length of the street. At the present time, should the street be widened, it would cut off the front yard of the Maffett property, adjoining the Episcopal Church.